If you guys read my blog post last month about Choices and Chances, you probably remember that I said that God won't open a door for us if He never intends to let us explore what's waiting inside. I told you too how I took the risk of losing my job for another job that I wasn't even sure I'll get. Well, here's an update regarding that: I got hired for the new job! It wasn't an easy transition, honestly. I had to bid goodbye to my long time friends in the Corporation as well as to my superiors. I also had to file a resignation letter, get a clearance, surrender everything the Corporation gave me, etc, etc. I wasn't able to get even a little time to relax because my contract with my new job started right away. But the good thing amidst all these is, I'm back right on track! 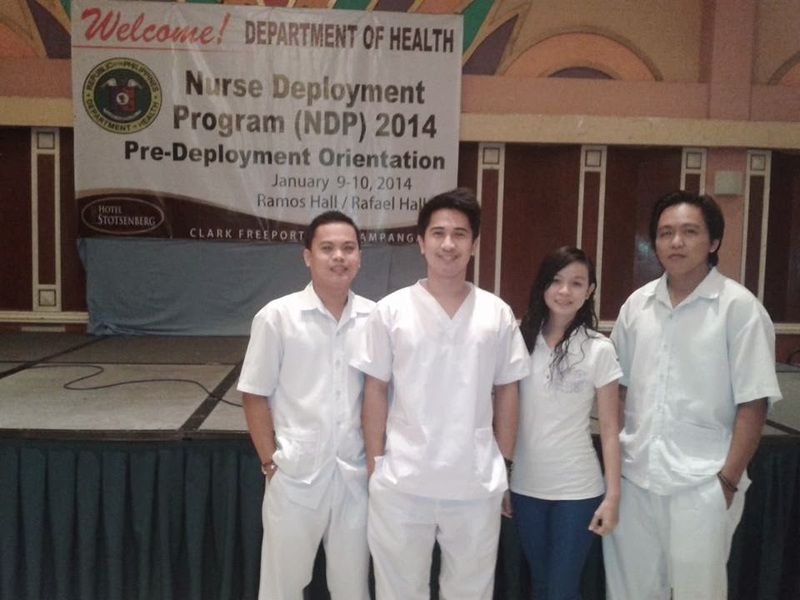 On January 9 and 10, 2014, the pre-deployment orientation for the successful applicants of Nurse Deployment Project was held in Stotsenberg Hotel spearheaded by the Department of Health. We were given an overview/review of different diseases such as Dengue Fever, Tuberculosis and Rabies among others, which we might encounter during our tour of duty in the community. We were given pointers and tasks to accomplish and we were also oriented regarding the scope of our responsibilities as nurses for the said project. Before our actual deployment to the Rural Health unit, we had a meeting with our DOH representative, Mrs. _________________ and she also introduced us to the Municipal Health Officer, Dra. ___________ and to the rest of the RHU staff. Our first day was spent in familiarizing ourselves on how the RHU works; the flow of clients, our tasks, management we can do on our own as well as the dependent interventions we should do. We also had an ocular tour of the vicinity and were oriented on the different forms we’ll use in the RHU. We were also given a mini-lecture by the Public Health Nurse regarding TB DOTS on January 16. On January 20, we had a courtesy call to our Mayor. The following weeks were spent mostly in the different barangays of our municipality. We had a courtesy call to the Barangay Captains and other officials. At the same time, we also looked for our respective Community Health Teams and Barangay Health Workers and we gathered the data we could use as a baseline for our upcoming duties. My nursing skills were refreshed when I became part of Nurse Deployment Project. It’s been a while since I last used what I have learned in nursing school and I am glad that this project gave me that opportunity. In my first few weeks as a nurse in the RHU, I learned new things such as: we now have the Penta vaccine, we have clients (4Ps) whose records have to be updated everytime they go for a check-up and we now have Community Health Teams. I was also able to do simple nursing procedures, learned how to prioritize clients based on their needs and provided health teaching whenever possible. I learned too how to deal with people of different ages and provide care and information to the best of my ability and knowledge. Some Community Health Team members no longer go to the Barangay Health Center due to political conflict with “new” barangay leaders. If needed, we might have to train new ones. If feasible, supplies, medicines and medical equipments should be given in a timely manner to the Rural Health Unit. Most of the clients we cater there cannot afford to buy medicines so it would be a great help if we’ll be able to give what they need for free. In case we can no longer convince the previous CHT members to continue their work, we’ll need support in training new ones. It has been a really busy month for me. But, I can say that everything's worth it! I am glad that I no longer have to work alone. Things look great and I am thankful to God for giving me an opportunity to be a part of this new program! :) Expect more journals in the coming months!